Some IndyGo riders say their bus stops were left in dangerous condition after yesterday’s ice storm. 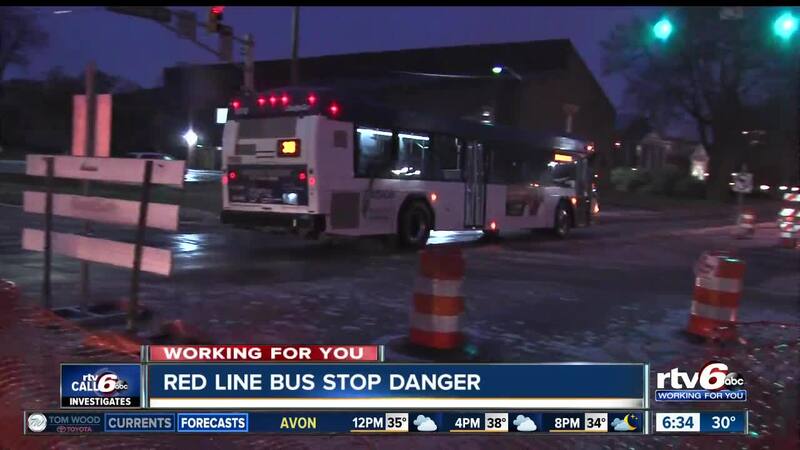 INDIANAPOLIS — Some IndyGo riders say their bus stops were left in dangerous condition after yesterday’s ice storm. The riders are wondering why IndyGo seemingly forgot to salt their temporary bus stops in the middle of Meridian Street. The path to the bus stops was less like a walkway, and more like a skating rink Thursday, after an ice storm slicked all the streets and sidewalks in central Indiana. The streets were salted, but the walkways were still icy. For people riding the bus, getting to the actual stop was dangerous. “They put this little tar right here, but it's kind of dangerous,” Zola Ijuyana, an IndyGo bus rider, said. “You can't really walk the way you would normally walk, you have to take baby steps, because you have to be careful, so you don't fall down and slip." The bus stops along the Red Line construction zone on Meridian Street were moved from their regular location on the sidewalk to the edge of the construction zone in the middle of the street. DPW crews salted the two opens lanes on Meridian itself, but they said salting for the two lanes blocked by construction and the temporary bus stops are the responsibility of IndyGo during the construction. "I haven't seen any salt at all,” Ijuyana said. “Not since I've been here, so you really have to be careful." In a statement, IndyGo says the stops were salted, but not in time before the freezing happened. "The IndyGo Red Line temporary bus stops were salted, but unfortunately not complete before the freezing occurred. Moving forward, IndyGo will work with contractors to ensure temporary stops are salted for inclement weather." Early Friday morning, IndyGo also put out a press release that states, "IndyGo Prepares for Winter Weather Advisory." In part, it says "IndyGo operations is practicing 'Safety Over Speed' and reminds riders to be safe and plan ahead." It also says, "Use extra caution and watch your footing as snow and ice can make sidewalks, steps, and bus floors slippery." This issue is just one of the many Call 6 Investigates has uncovered in the Red Line construction zone over the past a few months. Less than a month ago, bus riders were being forced to walk through construction equipment and jumping over holes in the ground to get on and off the bus. After that story, IndyGo made changes and only allowed people to get on and off the bus through the front doors. IndyGo also shored up the barricades between the walkway to the temporary stops and the construction areas -- and said they would be keeping a closer eye on safety concerns.